Let’s look at an example scenario in which a stream of data is being generated as a result of actions users take on a website. We’ll durably store the data and simultaneously feed a Kinesis process to do streaming analytics on something like cart abandonment, product recommendations, or even credit card fraud detection. If you don’t already have an application running on Atlas, you can follow our getting started with Atlas guide here. In this example, we’ll be using a database called streamdata, with a collection called clickdata where we’re writing data from our web-based e-commerce application. In this example, we’ll use a Kinesis stream to send data downstream to additional applications such as Kinesis Analytics. This is the stream we want to feed our updates into. If you don’t already have a Stitch application, log into Atlas, and click Stitch Apps from the navigation on the left, then click Create New Application. The first step is to create a database and collection from the Stitch application console. Click Rules from the left navigation menu and click the Add Collection button. Type streamdata for the database and clickdata for the collection name. Select the template labeled Users can only read and write their own data and provide a field name where we’ll specify the user id. 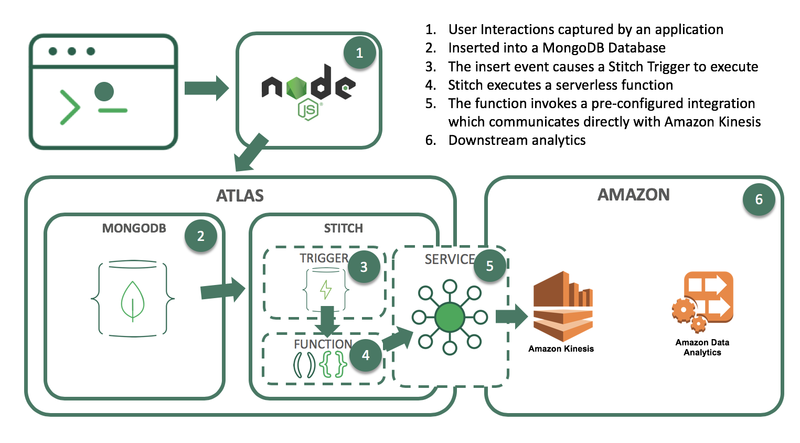 Stitch lets you configure Services to interact with external services such as AWS Kinesis. 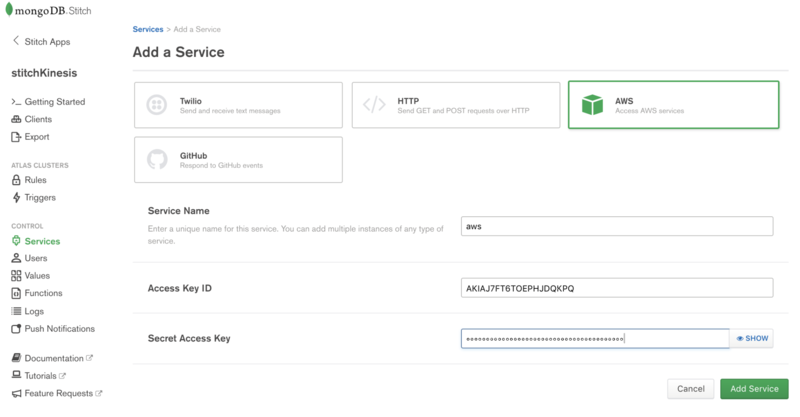 Choose Services from the navigation on the left, and click the Add a Service button, select the AWS service and set AWS Access Key ID, and Secret Access Key. Services use Rules to specify what aspect of a service Stitch can use, and how. Add a rule which will enable that service to communicate with Kinesis by clicking the button labeled NEW RULE. Name the rule “kinesis” as we’ll be using this specific rule to enable communication with AWS Kinesis. In the section marked Action, select the API labeled Kinesis and select All Actions. Now that we have a working AWS service, we can use it to put records into a Kinesis stream. The way we do that in Stitch is with Functions. Let’s set up a putKinesisRecord function. Select Functions from the left-hand menu, and click Create New Function. Provide a name for the function and paste the following in the body of the function. Paste the above into the console and click the button labeled Run Function As. Select a user and the function will execute. We’ve got our MongoDB collection living in Atlas, receiving events from our web app. We’ve got our Kinesis stream ready for data. We’ve got a Stitch Function that can put data into a Kinesis stream. Configuring Stitch Triggers is so simple it’s almost anticlimactic. Click Triggers from the left navigation, name your trigger, provide the database and collection context, and select the database events Stitch will react to with execution of a function. For the database and collection, use the names from step one. Now we’ll set the operations we want to watch with our trigger. (Some triggers might care about all of them – inserts, updates, deletes, and replacements – while others can be more efficient because they logically can only matter for some of those.) In our case, we’re going to watch for insert, update and replace operations. Now we specify our putKinesisRecord function as the linked function, and we’re done. As part of trigger execution, Stitch will forward details associated with the trigger event, including the full document involved in the event (i.e. the newly inserted, updated, or deleted document from the collection.) This is where we can evaluate some condition or attribute of the incoming document and decide whether or not to put the record onto a stream. Amazon provides a dashboard which will enable you to view details associated with the data coming into your stream. As you execute the function from within Stitch, you’ll begin to see the data entering the Kinesis stream. So far our trigger is pretty basic – it watches a collection and when any updates or inserts happen, it feeds the entire document to our Kinesis stream. From here we can build out some more intelligent functionality. To wrap up this post, let’s look at what we can do with the data once it’s been durably stored in MongoDB and placed into a stream. Once the record is in the Kinesis Stream you can configure additional services downstream to act on the data. 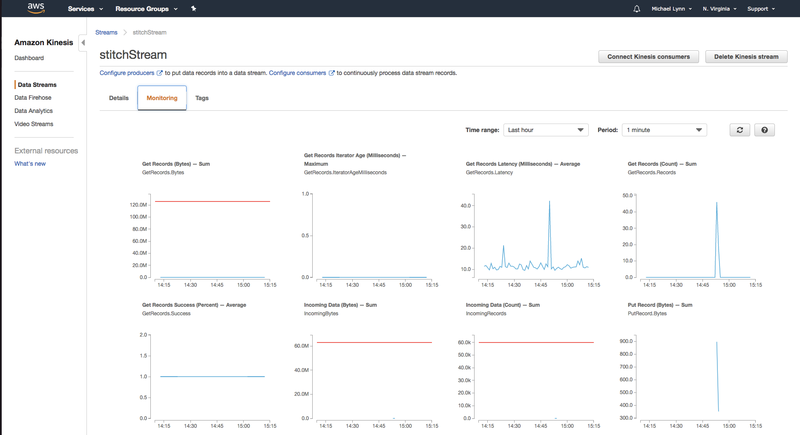 A common use case incorporates Amazon Kinesis Data Analytics to perform analytics on the streaming data. 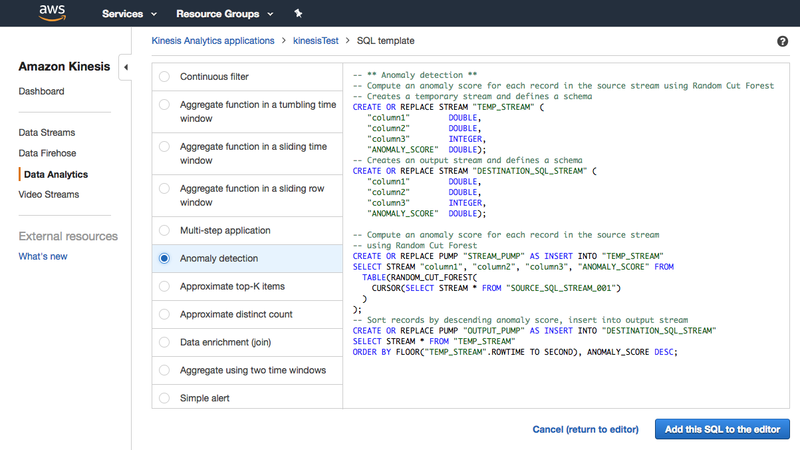 Amazon Kinesis Data Analytics offers pre-configured templates to accomplish things like anomaly detection, simple alerts, aggregations, and more. For example, our stream of data will contain orders resulting from purchases. These orders may originate from point-of-sale systems, as well as from our web-based e-commerce application. Kinesis Analytics can be leveraged to create applications that process the incoming stream of data. For our example, we could build a machine learning algorithm to detect anomalies in the data or create a product performance leaderboard from a sliding, or tumbling window of data from our stream. Now you can connect MongoDB to Kinesis. From here, you’re able to leverage any one of the many services offered from Amazon Web Services to build on your application. In our next article in the series, we’ll focus on getting the data back from Kinesis into MongoDB. In the meantime, let us know what you’re building with Atlas, Stitch, and Kinesis! 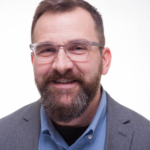 Michael Lynn is the Worldwide Director of Developer Advocacy at MongoDB. Previously, Michael worked as a Senior Solutions Architect at MongoDB, helping users optimize MongoDB for scale and performance.